Russia has a new drone, and if these first images are anything to go on, then it's not one you'll want to mess with. 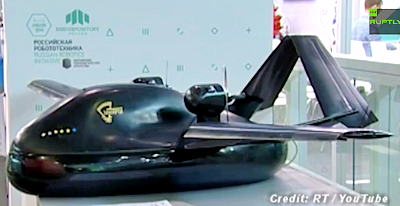 Created by the United Engineering Corporation, the Chirok is a reconnaissance and strike drone that can land and launch itself off of almost any surface. That's because this flying UAV is also a hovercraft. With an air-cushioned 'skirt' around the bottom, the Chirok can travel over land, water and then take off, flying at an altitude of up to 6,000m over and impressive 2,500km. What you're seeing here is just a 1:5 model. Its makers have already built an initial 750kg prototype that sports an impressive 10-metre wingspan. The prototype will be making a live demonstration at Russia's annual 2015 trade show. Its terrifying looks then are the least of your concerns because UEC says it'll then start work on a much larger 2-tonne variant that can carry supplies, missiles or bombs.